The nine is football’s most bsic and most important pass route and yet, it is nothing more than a race to the end zone — or at least as far as the Quarterback can throw. Selling the nine is convincing a defensive back that he is in that race every time a receiver releases from the line of scrimmage. The nine is basically is a straight line. As such, it’s the stem for many of the other routes a receiver can run. By stem, we refer to another straight line, the one a receiver runs when he escapes the line of scrimmage and races to the breakpoint of his assigned route. If a receiver can fool a defensive back into thinking he’s going deep, the the underneath routes that work off the nine open up. Separation — the goal of any receiver — becomes easier. This example of a passing tree is fairly simple, but it shows how the “9” is strictly vertical and other routes break off it. Note how even-numbered routes work to the inside while odd-numbered routes work to the outside. 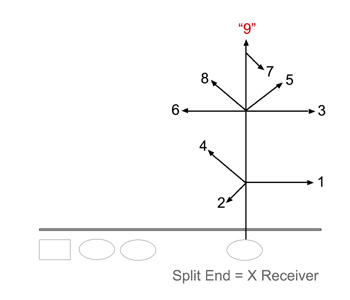 (Sample Passing Tree)The deception succeeds because the nine is a defensive back’s worst nightmare. “Don’t get beat deep” is the mantra he hears in his head each time a receiver lines up.The way, then, a receiver deceives a defensive back is by being consistent. Each time he runs a route that comes off the nine, he mimics the actions of a nine which derives its name from the passing trees found in offensive playbooks.It’s also known as a Take-Off, Streak, Fly or Go Route.